Stacked Coin Necklace, British Coin Necklace, Indian Penny Necklace, Silver Quarter Necklace, Old Coin Necklace, Silver chain with coins necklace. 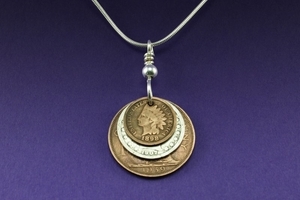 British Penny, Barber Quarter and a Indian Head Penny stacked with silver wire and your choice of bead silver or gold.This coin jewelry necklace is available on a sterling silver chain in your choice of chain- 18,20 or 24 inches. Can be made from your coins for $75. This handcrafted coin jewelry necklace is made in the USA.